With the recent higher temperatures in the upper 80 F° and low 90 F° range along with high humidity levels we will start to incur heat stress in livestock. Producers need to review their “game plan” for summer and be ready for warmer weather to help minimize the effects of heat stress in dairy herds. 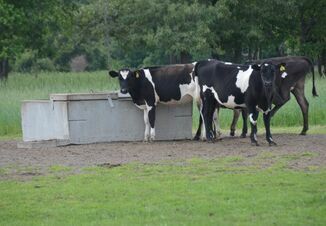 Dairy cattle have a comfort zone of between 41 to 68 F°. When the ambient temperature goes beyond 68 F° dry matter intakes will decrease on average 0.17 lbs. for each degree above 68 F°. Increase access to clean, fresh drinking water. This may involve adding extra tanks of water and checking for appropriate flow of water in drinking fountains. Consider adding temporary water access such as a split PVC pipe with flowing water or portable tank to cows as they leave the parlor. 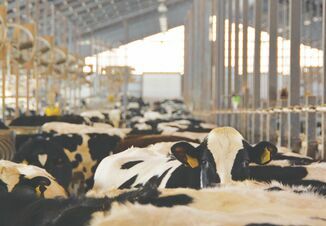 Cattle that are being exposed to a holding pen in a parlor should be cooled by a combination of air movement, water sprinkling systems, and shade. Make sure to use large droplets of water when sprinkling (soaking) cows, small droplets often found in misters will not allow for heat dissipation from the cow. Intermittent cycles allow time for the water to evaporate and cool the animal before the next cycle. Sprinkle cows with low pressure sprinklers over their backs away from the feed bunks. Trying to keep the udders dry in this process will help minimize the incidence of mastitis. Make sure all fans are working while providing the proper maintenance and cleaning. Adjust diets accordingly as dry matter intake decreases, utilizing higher quality forages and increasing the energy density of the diet. As diet adjustments are made, care should be taken to make sure that there is enough effective fiber to maximize rumination and keep acidosis and displaced abomasum’s to a minimum. Adjust feeding delivery to the cooler times of the day and increase the number of times feed is pushed up to minimize sorting. Manage high moisture feeds such as gluten and distillers’ grains to reduce secondary fermentation. Maximize feed quality by removing feed refusals before the fresh TMR is delivered and by not allowing excessive wetting from misters to occur. 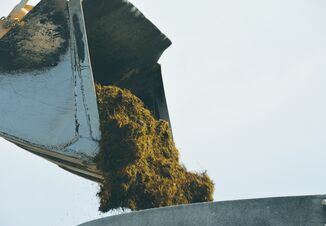 Remove only as much silage or haylage as necessary from the bunker face to minimize spoilage and secondary fermentation starting to occur. Research also has shown a benefit to increasing the dietary cation-anion difference (DCAD) in lactating cows when sodium (sodium bicarbonate) and potassium (potassium carbonate). As we know cow comfort is essential for high milk production especially during periods of heat stress. Taking the time to focus on cow comfort aids such as additional fresh clean water, air movement, shade, evaporate cooling via sprinklers, while providing energy dense, properly balanced, palatable diets will help minimize lost milk production and reproductive efficiencies due to heat stress.